Are Your Designer Handbags Authentic? Read Part 1 of the guide to learn about the Prada logo, zippers, and lining. If you're still trying to determine the authenticity of your bag, you should check the hardware, stitching, Authenticity Card and more. 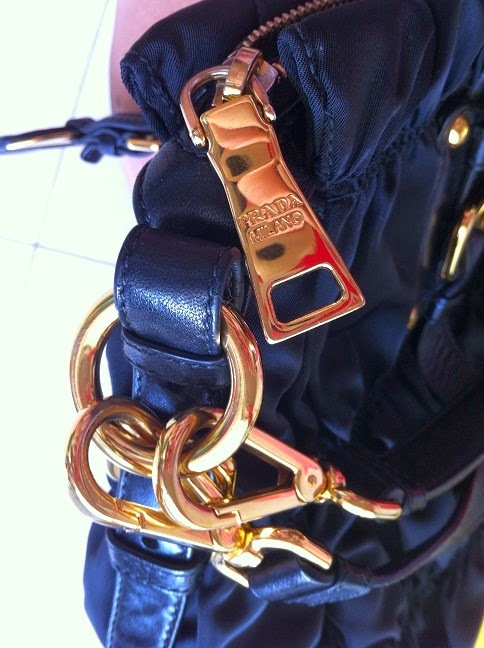 The hardware on Prada bags will be either silver-toned, gold-toned, or rose color gold-toned. It will only be one of those colors, not a combination of colors.All hardware – zippers, buckles, locks, knobs, clasps, chains, metal feet, etc. will say Prada. If it doesn't say Prada, it’s not an authentic Prada handbag. The letters will be very clean and clear. The stitching on Prada bags will be flawless. The stitching is small, clean, straight and uniform. Most Prada bags will have a small white tag inside the bag with a two or three digit number. Prada uses many different high-quality materials for their handbags. High quality fabric and leather will also weigh more than other materials. 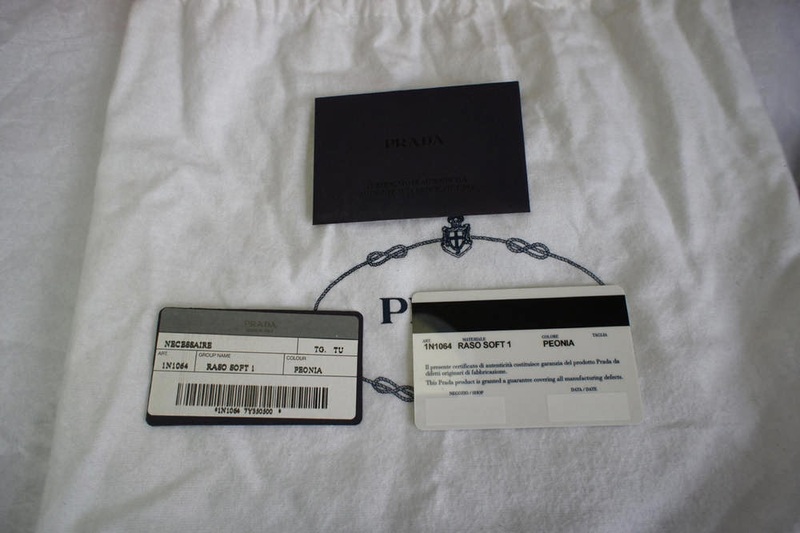 Prada products purchased from retail establishments will come with an Authenticity Card and a box. 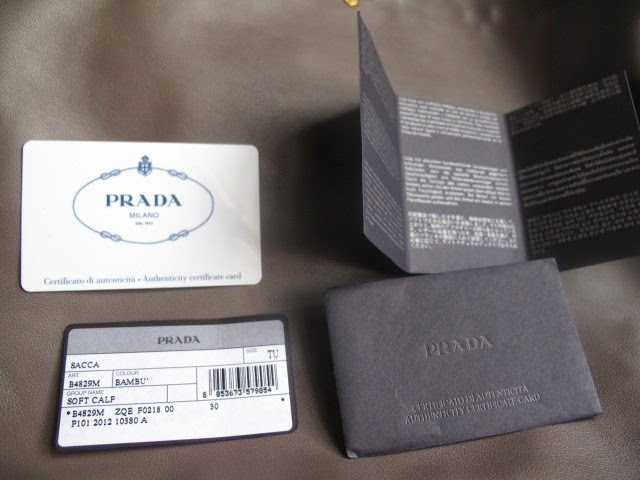 The box and envelope the card will come in is dark purple/black with the Prada logo embossed on it in a glossy but matching color. The Authenticity Card contains the style of the bag and its serial number. However, vintage bags don’t always have serial numbers. A Certificate of Authenticity – this is not the same thing as an Authenticity Card, and is not a real document. Prada bags also come with a dust cover. 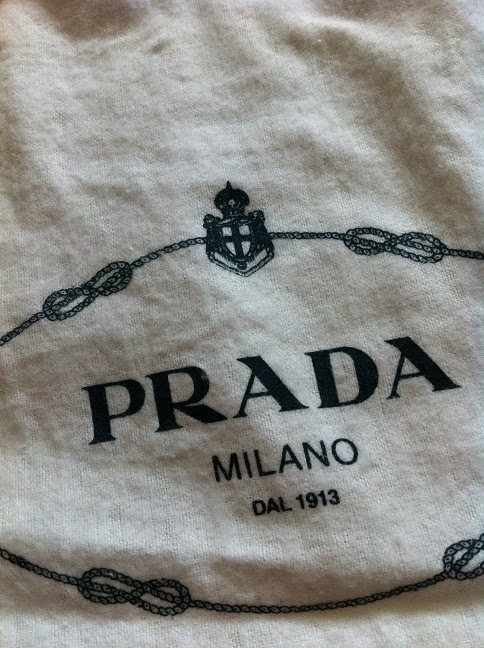 The dust covers are white cotton – that looks and feels like flannel – with the Prada logo embossed on the front in black. 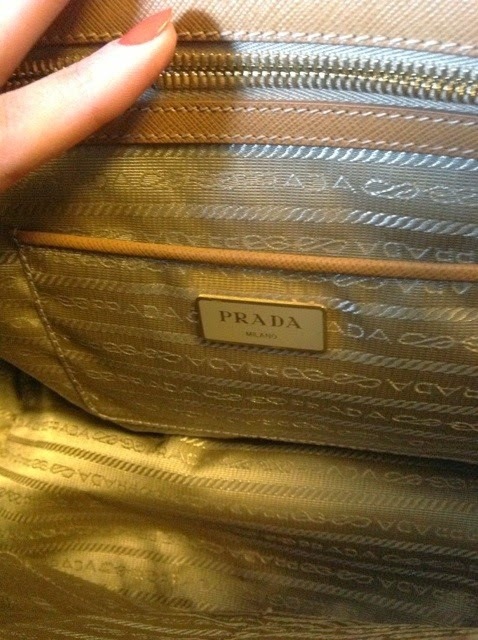 Prada handbags do not have any plastic or other wrapping on the hardware or handles. Older dust bags were navy blue with a gold embossed logo. A dust cover in different colors or fabrics. A dust cover with a crooked or logo or uneven lettering. I hope this guide has been useful in helping you determine if your Prada bag is real. Please let me know in the comments if you think I have something incorrect or if you know of any other ways to determine the authenticity of Prada bags. Prada handbags are one of the hardest types of bags to authenticate. It's impossible to say that a bag will "Always" have this, or "Never" have that because things change as new styles are designed. Replicas are also getting better and better every day, making it harder to distinguish between an authentic bag and a fake one. For those reasons I can't guarantee anything, but hopefully with this guide you will have a better idea of what to look for, and what to look out for. Most handbags have the Prada logo outside, usually in the center on the front of the bag. The logo can vary, but is often the triangle plaque. The Prada logo plaque will be firmly attached with neat, even stitching, as well as rivets on all three corners of some styles. The rivets on newer bags will be completely filled in, while older styles will look like donut holes. The color of the plaque will match the exact color of the bag or be very close. The letter R on the Prada logo will be curved with a notch taken out of its right leg. The letters will all be uniform in placement, size, and spacing. The plaque will have a nice thickness to it, and the logo is slightly raised. 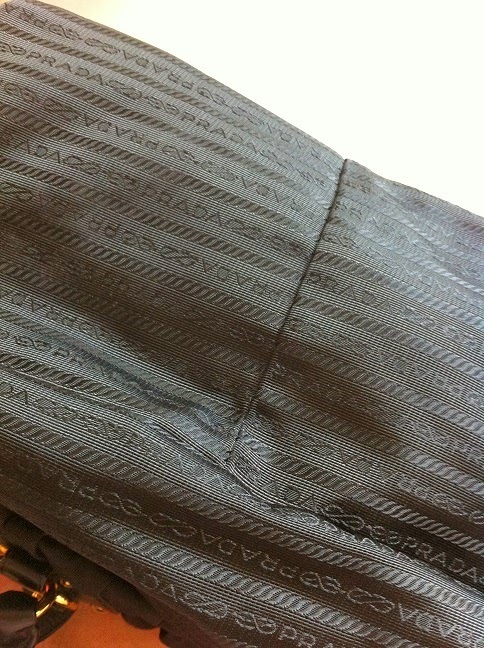 Some styles of Prada handbags have an embossed logo instead of the triangle logo. Prada bags will have also have a logo plaque on the inside of the bag. 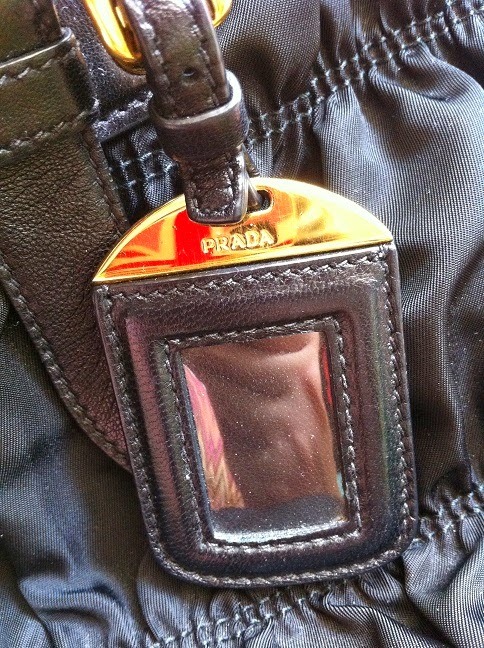 The Prada plaque will usually be made of enamel, but can be a leather patch. The color of the enamel will match or be very close to the color of the lining. The plaque will have a rim around it (gold, silver); this will match the hardware of the bag. If the logo is a leather patch, it will be attached with four rivets. The plaque will firmly be attached on all sides, and you should be able to feel a piece of backing material underneath it. All four corners of the Prada plaque will be rounded. The letter R will usually be curved, but a few newer models have a straight leg. 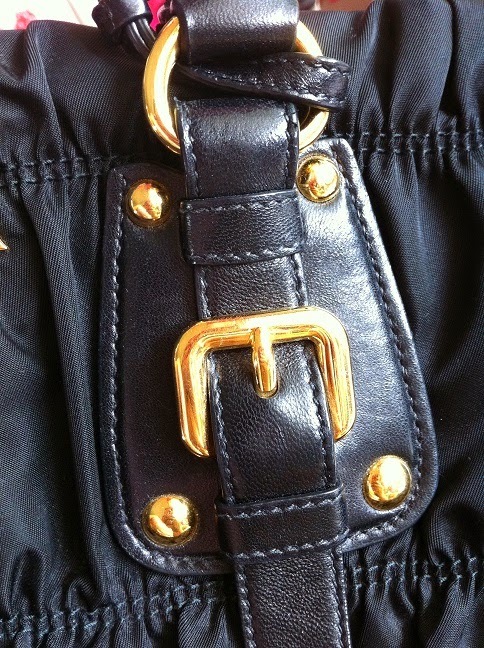 The zippers can also be very helpful in determining a handbag’s authenticity. 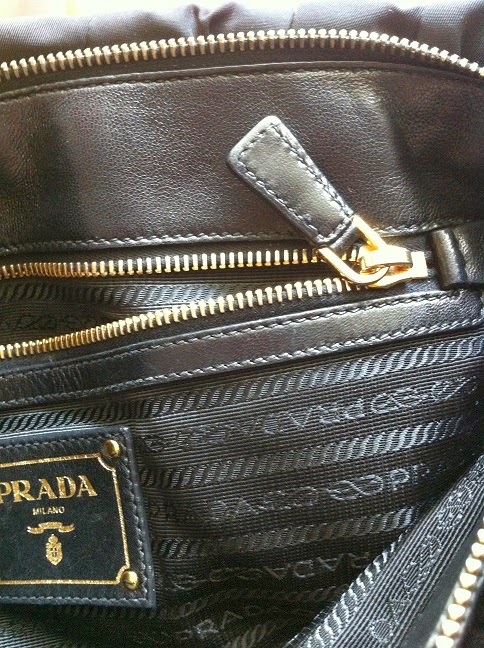 Prada only uses high quality zippers from Lampo (with and without the lightning bolt), Ykk, Riri, Opti, and Ipi. These names will be embossed on the back of the zipper. Older bags used plastic zippers on the inside, but newer bags use mostly metal zippers on the inside and outside. 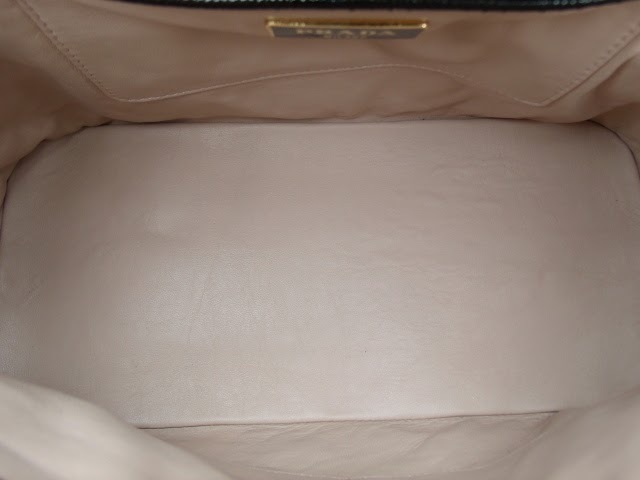 A lot of Prada handbags will have its signature interior lining. 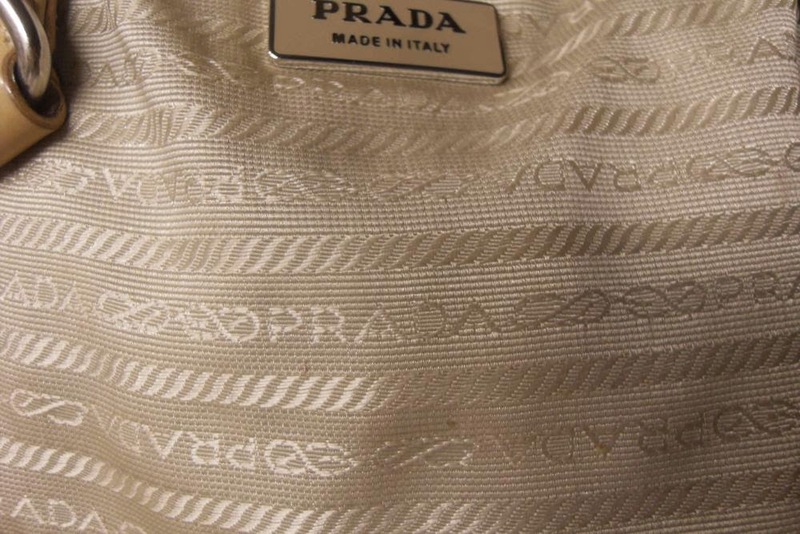 This is the Prada logo repeated horizontally throughout the lining with a symbol that looks like a fancy sideways S ( For example: Prada~Prada~Prada~). Other possible linings are smooth calf leather (vitello), satin (raso), and nylon. 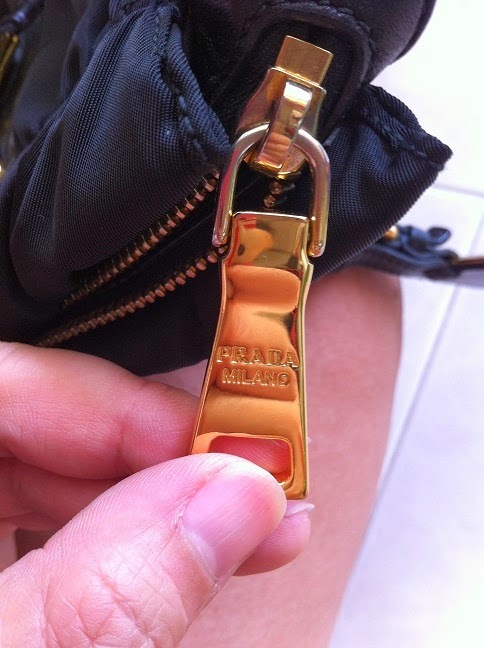 Hopefully these hints will help you in determining the authenticity of Prada bags. Part 2 will discuss more things to check including the hardware, materials, and authenticity card. Is Your Chanel Handbag Authentic? How can you tell if that gorgeous Chanel bag is real? There are a few key things to check including the authenticity card and sticker/serial number, tag, dust bag, booklet, material, label, hardware, and logo. 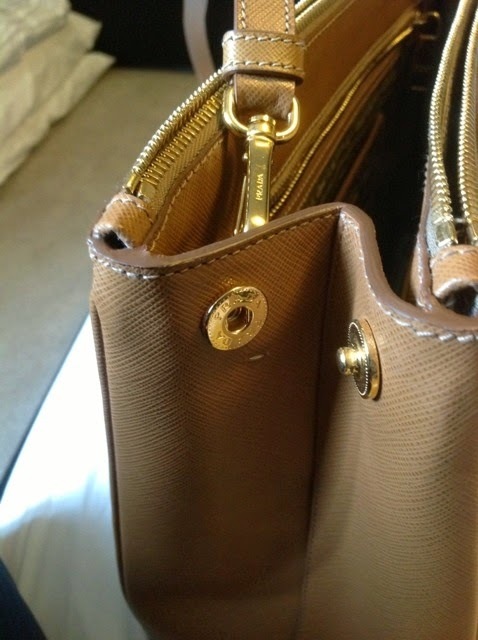 All handbags and accessories (wallets, palm pilot cases, key holders and agendas) made in the late 1990's to present have a small white rectangular sticker with two gold circle cc logos. Below the logo is a black 7-digit serial number. For 2005 and beyond, the serial number is 8 digits. The sticker is covered with a sticky clear tape. The white sticker is divided into four separate sections (4 triangles) and can be peeled off. The left side of the sticker is a thick light black/purple line (you will not see this line if the interior is black, brown or navy). The right side has CHANEL, CC, CHANEL, CC (don't worry if CHANEL is cut off and you will not see this if the interior is black, brown or navy). The 7-digit or 8-digit serial number on the sticker must match the serial number on the authenticity card. 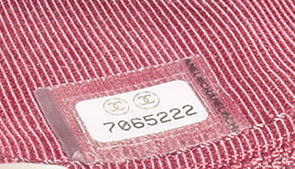 The 7-digit serial number sticker is usually located inside the bag at the lower left hand corner on the opposite side of the Chanel stamp or label. 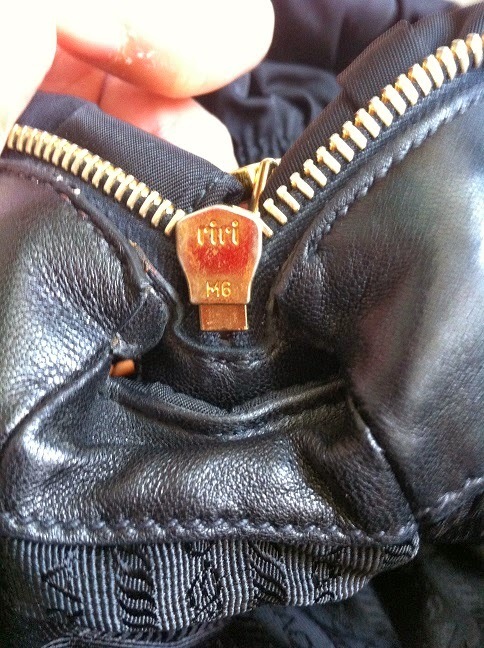 Other places where the sticker can be found include: inside the interior zipper pocket, inside the exterior open pocket but not the back pocket, and on a small leather patch located on the left hand corner on the opposite side of the Chanel label. The serial number must face upward so it is easily read. 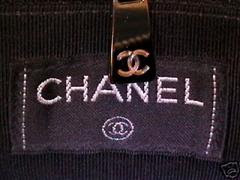 Authentic Chanel items never have a tag hanging off it. 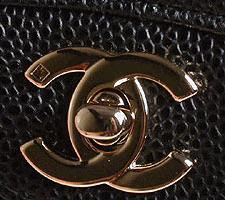 What may look like a pretty metal tag with words “Chanel” on it, or a leather tag that says “Genuine leather” will not be on an authentic bag. The only appropriate tags are a paper store tag or a Chanel paper tag. These will only be white with black lettering. 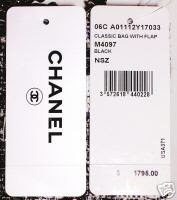 Authentic Chanel dust bags are black with white lettering. 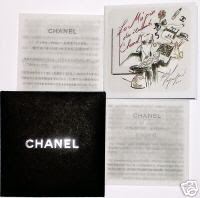 An authentic bag will have a booklet that pulls out as opposed to a "book" syle booklet. Gold or silver CHANEL stamp on the interior leather . There is a gold stamp if the hardware is gold, and a silver stamp if the hardware is silver. 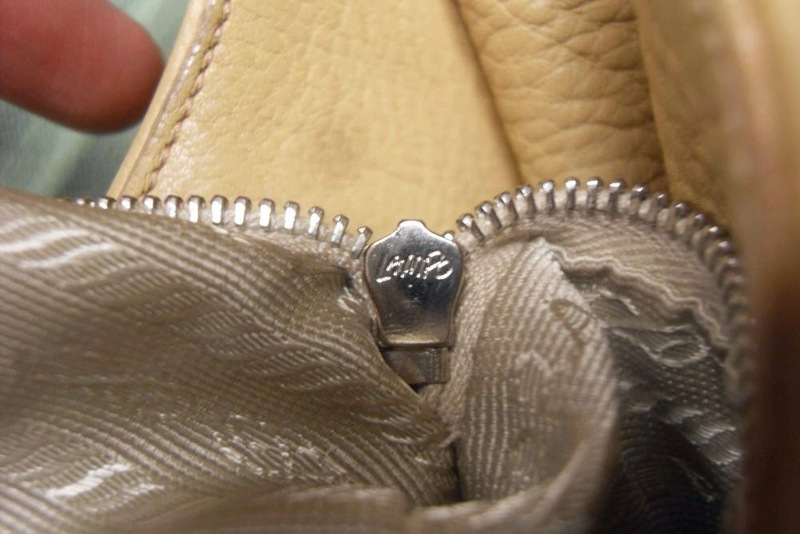 The CHANEL stamp is in front of the interior open pocket, above the interior open pocket, or in the lower portion of the interior flap. The MADE IN FRANCE or MADE IN ITALY stamp is either gold or silver, depending on the hardware, and is directly under the CHANEL stamp or at the opposite side of the CHANEL stamp. CHANEL embossed in the interior leather . This is located above the open pocket, in front of the interior open pocket or in the lower portion of the interior flap. MADE IN FRANCE or MADE IN ITALY is embossed in the interior leather at the opposite side of CHANEL stamp or directly under CHANEL. Rectangular leather label with CHANEL stamp in gold or silver . Again a gold stamp if the hardware is gold, and a silver stamp if the hardware is silver. 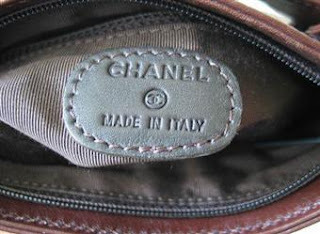 The MADE IN FRANCE or MADE IN ITALY stamp is directly under the CHANEL stamp. The label can be of any color and matches the color of the exterior. No contrasting color stitching. Oval leather label with CHANEL embossed in the leather . Circle CC and MADE IN ITALY are embossed directly under CHANEL. No contrasting color stitching. Black label with CHANEL in white letters . No contrasting color stitching around the label. Black label with white vertical lines . White vertical lines are fine as long as the contrasting stitching is not around the label. The CC hardware is shiny gold, matte gold, shiny silver, matte silver, resin, tortoise or clear plastic, depending on the style line and must match the chain strap and zipper pull. The CC hardware is either turn knob closure or interlocking CC snap closure. Some vintage styles have circle CC. Other styles have CHANEL engraved in the metal. The back of the CC turn knob logo hardware is a rectangular plate with two screws. In some styles, like the Jumbo classic bag, the back of the CC turn knob logo hardware is an oval plate with two screws. 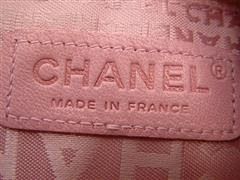 Whether the back plate is rectangle or oval, CHANEL is engraved on the top and PARIS on the bottom. For plastic CC turn knob logo hardware, the back side does not have the CHANEL, PARIS engraved. Note that Chanel uses diagonal screws and not the Phillip type. CC logo is sometimes quilt stitched in the front the bag. Whether the CC logo is gold, silver, stitched or other material, the top portion of the right C must overlap the top portion of the left C. The bottom portion of the left C must overlap the bottom portion of the right C. Sometimes there is no overlap but a smooth CC logo. In a very few vintage Chanel handbags, Chanel has done the reverse overlaps on their interior flaps. Currently, a specific ballerina shoes line has this reversed CC overlap on the right shoe and the traditional CC overlap on the left shoe, for the mirror effect.